Amazon usually has stuff up pronto. I hope there aren't any US-style issues with Nintendo. No idea, Amazon has a pick and mix of what they sell directly. They only sell a couple Wii U bundles directly, the rest are through other people; same with 3DS too. Thanks for that. Now I have to decide on black or white. I only want to order it on Amazon because I can return it if it's on firmware incompatible with hacks. I've seen the white ones because I bought a couple for my nieces. Will post some pics of those soon with the faceplates. Mine shipped with Fedex from Play-Asia. I wonder if it will get stuck in US customs and how do I resolve it if it happens? I ordered it to a friend's place as I am travelling and don't want her to have to pay any taxes or duties. Mine only took about 24 hours to clear. Shouldn't be a hassle. Edit: forgive the poor picture quality, done on phone. The pink cover is the one with the Mario design but you can't really make it out in this pic. 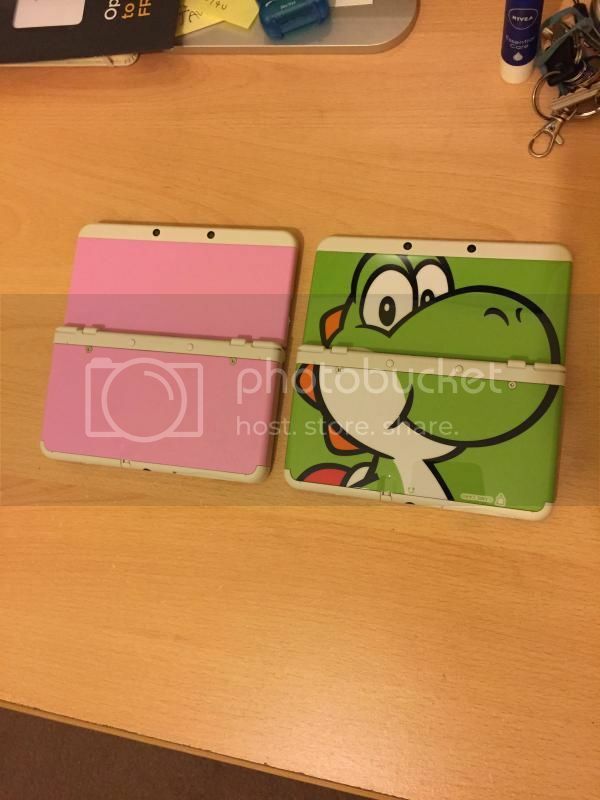 If anyone wants to know, the Yoshi one is a shiny one, not matte unfortunately. It still looks SUPER awesome though. I like the Yoshi 3DS OS theme except the bottom isn't great where you have your folders and games etc. Ahhh thank you so much for the Amazon link! My friend was super disappointed that she missed the Nintendo store ones, so this is awesome. Got my AU white N3DS unit in today. Shipped with 9.0! Come on, Gateway! bombcast is making me worry a bit about transfering between my 3ds and n3ds. something about doing it over wifi takes 8 hours? I have a pc so I should be able to do it normally right? Is there a good step by step around I can bookmark? Have a 3ds. will have a new 3ds. 32 gb microsd. Pick that you'll move the files yourself. Turn on N3DS with Micro SD in it. That's so nice. I must admit I am a little bored with the grey and white ones so I think I'm going to have something colourful instead. 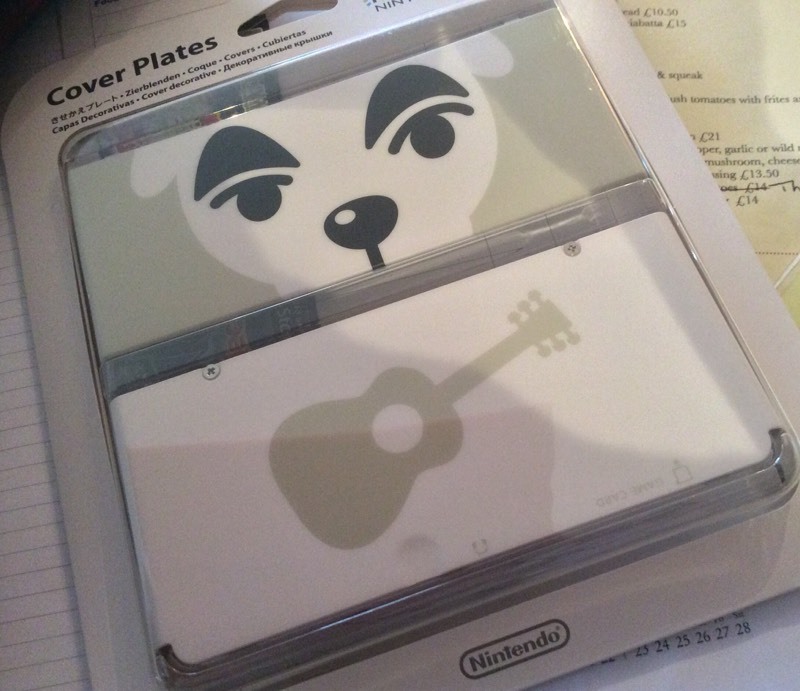 Did I read somewhere that some of the Japanese cover plates come with a code for the matching theme, or did I imagine that? I was playing the smash bros demo and the circle pad snapped off. Same happened to me on my regular XL..
Yeh but it's only one or two of them I think. Uh oh.. I just tried plugging my apple ear buds into my New 3DS and the whole system shut off. When I turned it back on the wireless function was back on and the date and time had been reset.. I had used other headphones fine previously, anyone else had this problem? Nintendo finally acknowledges that Apple is their true arch nemesis. Sounds like they shorted something out. Dodgy earbuds? Sweaty connector? Lol. They are old earbuds, but have been working in other products. I'll try other headphones later and see. If other's don't do it, I will probably ring Nintendo anyway and see what they say. Apple do have a slightly different connector in terms of grooves than what was standard before that, although they're quite often interchangeable now. It could be that, but surely Nintendo tested it. Hm, if thats the case, it'd be interesting to see if it happened on other peoples systems too. Do you mean the connector with the extra line on it? Yeah, like the box in headset from my iPhone 3/4/4S wouldn't work in my Nokia N95/Samsung Apollo and vice versa even though they were all earbuds with a mic. Maybe that is it then. The ones I tried had the volume controls etc and has three white lines on the plug. recently imported a white AUS N3DS after its absence in the nintendo direct for the US. Should have been patient and waited for the uk preorder to import and save some bucks, but oh well. Are they the in-ear canal ones from the iPhone 5 and above, or the old flat ones? If it's the latter, I've got an old pair from the 4S at work I could try. Must be 4S. They look like this. Ah okay. I've never used my Apple headphones cos I thought they'd be junk. 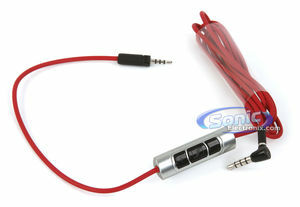 My Sennheisiers have volume control built into one of the cords and a different connector, and I regularly use them with my New 3DS. They're the ones. Mine are so broken that the right earbud barely works, so if anything shorts them, it'll be them! They totally are junk and I use my Pulse Elites all the time with it and the cable that comes with it are the 3 grooved ones too, but in the standard layout. The right one on my isn't so great either, so it will be a good comparison. I only use them sometimes as they are just always in a bag I use. I know they aren't great. Having said that, I now use a FiiO E6 in between. Ok got home and tested a normal set of headphones and there are no problems. Looks like the apple ones caused it to freak out somehow. Apple's 'earpods' are not junk, they're very good for the price. Quite suitable to games too, saturated lower mids, works very nicely for chiptunes. Far better than included headphones with almost any other phone. It's the old earphones (pre-iphone 5) that were not much good. So, the ones we're talking about then? Well yes, but Peagles might have more recent ones? Also just pointing out that they sound great with handhelds! Especially the original Game Boy! I have 5S ones but I've never even opened them, I use Sennheisier Momentums mostly. Nintendo asked me to fill a survey about the N3DS and interestingly one of the questions asked if I had imported the system from Japan or Australia. Bit odd since the only reason I assume I got the survey in the first place is because I bought one from them so an importer would never get this survey unless they bought another N3DS. Yeah, that's odd. I mean my N3DS XL is linked to my NNID, but I've had no such survey. I actually remembered to bring my iPhone headphones home with me and they worked perfectly fine, no shorting at all. Wonder what happened. I got one too. I think. Well thats not good.. Maybe I should contact Nintendo.. I really don't like the pixel density of my XL, or the colour I got it in (white). I think I can handle the smaller screen size. But I have no idea if it would be comfortable... my XL is uncomfortable at times, more so when I have it in a claw grip, and less so when I have my palms spread out so the thumbs are approaching horizontally from the sides. Is the latter grip feasible on the non-XL? I'm 6'2", hands about 7-8" long. Do DS games look alright on the non-XL, or do they have noticeable blurring? How usable is the 1:1 pixel mode? Has anyone noticed slight differences in frame rates on the N3DS? Comparing a particular room on ALBWs, it drops and becomes a bit stuttery. Where on an old XL, it doesn't react in the same way, seems a lot smoother. Seems as though my N3DS shows drops a bit harsher. The room I was comparing was the first room of the tower on the advanced difficulty. The frame rate drops with just the one green chu chu. Once more chu chus come the drops seem about equal. A co worker tranfserred from a 3DS XL to a New 3DS. Only 200/1200 Puzzles where showing. So we deactivated Streetpass and reactivated it. Then 500/1200 Puzzles where showing. But wheres the rest? We deactivated it several times now and dont know what to do. Any clues?